Spiegel & Grau, 9780812984897, 384pp. Regardless of how wealthy or poor their parents are, all black boys must confront and surmount the “achievement gap”: a divide that shows up not only in our sons’ test scores, but in their social and emotional development, their physical well-being, and their outlook on life. As children, they score as high on cognitive tests as their peers, but at some point, the gap emerges. Why? Filled with innovative research, practical strategies, and the voices of parents and children who are grappling with these issues firsthand, Promises Kept will challenge your assumptions and inspire you to make sure your child isn’t lost in the gap. 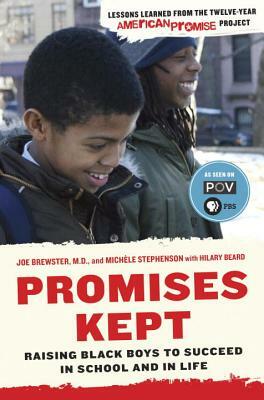 Joe Brewster, M.D., and Michèle Stephenson are the directors of the award-winning documentary American Promise. Brewster is an attending psychiatrist at Harlem Hospital in New York and an assistant clinical professor at Columbia University. He was raised in Los Angeles and studied medicine at Harvard University. Stephenson has worked as an international human rights lawyer and a film producer. She is a graduate of Columbia Law School. Hilary Beard is the co-author of several books, including the New York Times bestsellers 21 Pounds in 21 Days: The Martha’s Vineyard Diet Detox and Venus & Serena: Serving from the Hip.